Striving for peace and the exchange of thoughts related to it, is an on-going process throughout the ages. Cynics state that peace is the short period of time between wars. But conflicts, fights and destruction also know a counterpart. We aim for a more optimistic, positive approach. By organising ‘Hold…on. Buddha Enlightened, Art & World Peace, we say: ‘Stop. Hold on! Take some time for reflection about peace.’ Peace is a loaded issue. It is linked up with the long-cherished desire of mankind. But peace is also about dialogue, about being open to different opinions. The well-known art critic and philosopher Boris Groys wrote ‘Art has its own power in the world’. The invited artists will bring our theme back to where they are most powerful: Art. What is the meaning of peace for the invited artists? How is it explored through their work? The selected artists come together in this holy site of Buddhism, Bodh Gaya, where Gautama Buddha found his enlightenment under the Bodhi tree. The village receives 100.000s of tourists and pilgrims each year. 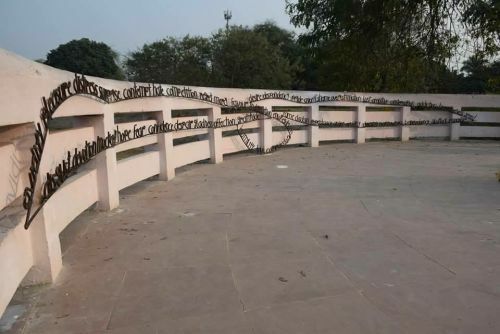 In the Maya Sarovar Park, the artists will work on artworks that reflect the world in an often personal, philosophical, and poetic way. The works to be shown will give food for thought and intend to create a dialogue with a broad audience and so, be spread around the world. Buddha Enlightened, Art & World Peace is an artists’ initiative set up by Sanjeev Sinha in 2005. The title refers to the entangled visions in society: spirituality, politics, religion and existence. ‘Enlightenment’ as spiritual knowledge coming from the East or of late 17th & 18th philosophy in the West, contradictory but at least a critical questioning of customs and morals. We aim for a new understand or interpretation of the term enlightenment.